Wow. I am soooo excited! I contacted Tina who started Baby Be Blessed, the place that sells those a-dor-a-ble dolls I bought for my girls for Christmas (except they won’t be ready, because I ordered them too late) but anyway, I contacted them to see if she *might* be willing to donate a little incentive. You know, to help this upcoming fundraiser at My Adoption Website be the very best it can be… and raise all kinds of support for An Orphan’s Wish! So now, in addition to feeling really wonderful about doing something awesome to help the kiddos at An Orphan’s Wish stay warm this winter, you’ll also get a chance to win your very own personalized Baby Be Blessed doll! I can’t keep myself from overusing exclamation marks, I’m so excited!! How cute?? I mean, how crazy cute are these sweet dolls? The winner can choose the doll (or lamb.. they have lambs, too!!) of your choice. You’ll also get a personalized Scripture patch, that will be sewn onto your Baby Be Blessed doll, with your child’s name, an important date if you’d like, and the scripture of your choice! Shop the fundraiser on November 18th… you’ll even be entered if you bid on an item, but don’t win! If you’ll be donating something, just give me a shout out in the comment section, sorta like you guys did yesterday, and I’ll be sure to pass along your names to Jennifer. Jennifer will be keeping everything organized on her end, which is most definitely not my gift, so if you email her to donate an item or bid on an item during the fundraiser, she’ll automatically enter you… once for each item you donate and each item you bid on! Then, once the fundraiser is over, we’ll choose a winner! But by then, we’ll all be winners. Winners for not just letting another opportunity to bless an orphan pass us by. Just knowing a little one will be warmer, cozier and happier will be the best *prize* we could get, won’t it? This question is totally unrelated to your post…but we've been following your journey to Miss Vivi closely and were wondering if you had your I-800 Provisional Approval yet? We are currently waiting for this, and were wondering where you are in this crazy process. Thanks! I donated 4 dresses to the Auction!!! Can't wait to see what Jen has this year!!! Woo hoo, Stef!! Those dolls are so cute. I am taking pics this morning and getting them over to Jen. I am so sentimental, it is hard for me to part with some things, but love to do it for a great cause!! Hope yours comes soon, too!! Thank you SO much Lynn, Jessica and Miss Diana 🙂 I am truly grateful… can't wait to see how God blesses your efforts, everyone's efforts, to help raise funds for An Orphan's Wish! P.S. Michelle, I am just the same as you… but thankfully it's for such a good cause!! These dolls are cute! 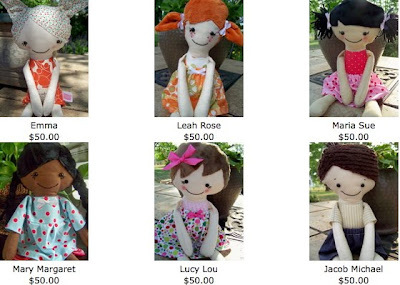 You should also check out the dolls at http://www.bitofwhimsydolls.com. She makes patterns and has Limited Edition Dolls as well. I am so excited about this fundraiser! Thank you to EVERYONE who helps in any way through bids, donations or just praying for An Orphan's Wish. I just sent pictures of two items I'd love to donate. Hope lots of money is raised! Just sent pictures of 4 items. I wanted to do this last year but didn't have the chance, I'm sooooo glad she did this again and I get to participate. I am donating a Hanna Andersson Dress, new with tags and matching hair clips. Can't wait for this sale!!! Can I enter the drawing if I purchased an item or only if I BID on an item? I just bought a cute pair of boots for Sophie! Can't wait to see who the big winner of the Baby Be Blessed doll is! !